Bella Henna designs stunning crowns. Beth is a repeat client who loves to show off her gorgeous bald head. The design is based on the 1920's flapper hats and jewelry-check it out on Buzzfeed.com. 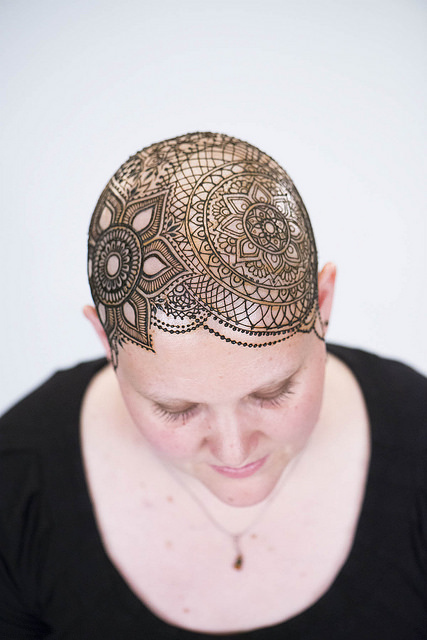 Beth first came to Bella Henna while she was going through chemotherapy. She came again to celebrate her wellness, and this time arranged to have the entire process of decorating her documented in a fabulous henna crown photoshoot with top Cincinnati photographer David Rafie.